The increasing global demand for food has implications for agricultural production, food processing, regulatory oversight, and immigration policy. Often overlooked is the health and well-being of agriculture workers including safety, access to health care and successful integration into local communities. Successfully addressing the complex challenges that surround the changing agricultural workforce benefits from bringing together diverse stakeholders to find common ground. On January, 16, 2014, more than 60 agricultural workers, producers, health professionals, extension agents, university faculty and other interested individuals gathered at the Minnesota Landscape Arboretum, Chanhassen, MN, to explore The Changing Agriculture Workforce: Challenges and Opportunities for the Worker, the Employer, and the Community. 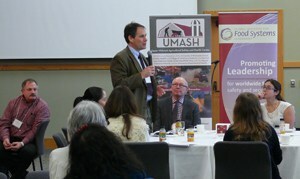 This forum was jointly hosted by the Center for Integrative Leadership, the Center for Animal Health and Food Safety, the Global Initiative for Food Systems Leadership, and the Upper Midwest Agricultural Safety and Health Center. Mexican Consul, Alberto Fierro, opened the forum by stating the consul’s commitment to enhancing the relationship between Mexican agricultural workers and farmers. A panel of stakeholders, including a dairy farmer, clinician, agricultural worker, and an extension educator shared their perspectives on the changing agricultural workforce. Each described the current environment in which agricultural workers function as well as pointing out the opportunities and challenges. Some challenges included culture and language barriers, gaps in health services, scarcity of accessible safety programs, lack of resources and knowledge among workers and employers, and the uncertainties of immigration reform and documentation issues. One farmer described the importance to him of discovering that both he and his Hispanic employees shared a deep commitment to family. Examples of opportunities included the empowerment achieved through bilingual language training, common skills development, utilizing relationships with farmers’ cooperatives and professional organizations as a platform to provide information and resources and to build confidence in health, educational, legal and occupational systems. Two examples were presented to demonstrate farmers and workers have found common ground for progress. Both embrace the concept that a safe and healthy workforce means productive workers that contribute to the farm’s success and the community’s vitality. Beyond the economic value of positive employee-employer relations, there are higher-level gains, like mutual happiness and a stable workforce. Small group conversations were facilitated to share diverse perspectives and find consensus. Six focus areas emerged: 1) Easier access to healthcare; 2) Increase farmer-worker cultural and values awareness; 3) Ensure certification programs such as fair trade labeling include agricultural worker safety and health; 4) Social networks for workers to share resources; 5) Methods to distribute useful information and resources to farm owners, and 6) Understanding the spheres of influence around the farmer. 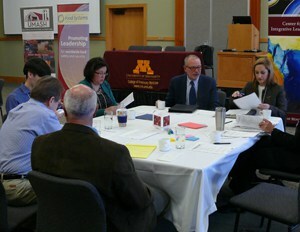 The initial discussion focused on expansion of mobile health services and awareness of available resources. Direct health care provided on the farm is most likely to be used by farm workers. Develop new partnerships to expand culturally appropriate mobile health services. An example is providing nursing services that can offer biometric screening (glucometer, cholesterol test, blood pressure cuffs and scale/BMI chart) on larger farms and means to monitor agriculture workers with chronic diseases. Improving farmer and worker cultural understanding could include programs with an educational focus to convey “farm family” messages and core values, and provide a platform for sharing personal success stories through a documentary. This could reveal the shared values in the worker-farmer relationship. Develop a curriculum in culturally appropriate farm management techniques through workshops or webinars. This could improve communication between workers, farmers and the agricultural industry. Existing programs encourage producers to employ exemplary practices and management techniques leading to certification and labeling of their products. This has been largely driven by demand from consumers desiring safely and ethically produced food products. Examples include the Good Agricultural Practices (GAP) program that fosters safe hygiene practices and product quality assurance to promote food safety. Other programs focus on safe food as well as fair treatment of workers in terms of wages and worker health and safety. Certification programs in dairy include efforts to promote animal welfare, but are limited when it comes to worker health and safety. Integrate best practices for dairy worker health and safety into existing certification programs. This process can be started by 1) reviewing criteria of successful certification programs; 2) encouraging a consensus dialogue among all stakeholder (producers, workers, insurance companies certification and inspection bodies, consumers distributers, etc.) developing a unified criteria (certifications, requirements, consumer assurances) that optimize worker health and safety as part of the certification process; and 4) incorporating financial incentives to maximize worker health and safety certification programs such as insurance costs. The need was expressed for an online space in which farm workers and farm owners can anonymously interact to ask questions and share information. Others with resources would be welcome to the conversation and expand their support network. It was suggested that an online information network is needed that would initially survey workers in a confidential manner to identify what information they need and how to make it accessible. There is an important need to open and maintain clear channels of communication between employers and other resource providers. Many interested parties would like to see resources compiled and made accessible, with built-in feedback mechanisms to improve quality and appropriateness of resources. Stronger channels of communication could be encouraged by making a greater effort to understand the “world” of a farm owner to identify potential communication opportunities through stakeholders that may already have a platform of trust and respect with the farm owners. Attempting to improve farm safety by delivering safety messages directly to farmers has not met with a high degree of success as evidenced by the national statistics on farm injuries. However, there are many influential individuals and organizations with whom farmers interact, who have a vested interest in the sustainability of the farming operation, a sustainability that is threatened by safety hazards on the farm. Examples of these include agricultural bankers and insurers, farm equipment manufacturers and vendors, veterinarians, cooperatives etc. Understanding the influencers’ degree of knowledge and commitment to the safety of farmers and characterizing their efforts to deliver and reinforce safety messages in their interactions with farmers is an important first step in enlisting them to help improve farm safety. 84% of attendees indicated they found the program to be valuable, increased their understanding of the issues, helped them listen with an open mind, gave them a greater respect for different viewpoints, and felt the knowledge and insights gained will impact their workplace. 94% felt the format allowed them to share their views openly and helped them find common ground. 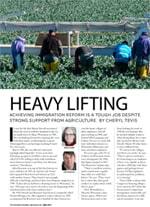 The May 2014 issue of Successful Farming featured an article on the topic of immigration reform and the impact on agriculture. The article mentions the Finding Common Ground Forum, and also includes interviews with FCG attendees and panel members.